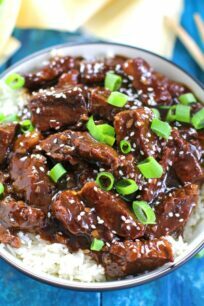 Instant Pot Mongolian Beef is a very easy and delicious meal you can make in just under 30 minutes. Sweet, juicy, and garlicky, is the perfect Asian dish to make using Instant Pot, and healthier than takeout. We love making easy and delicious Asian dishes in the Instant Pot such as our famous Instant Pot Orange Chicken, Instant Pot Mongolian Chicken and Instant Pot Beef and Broccoli. 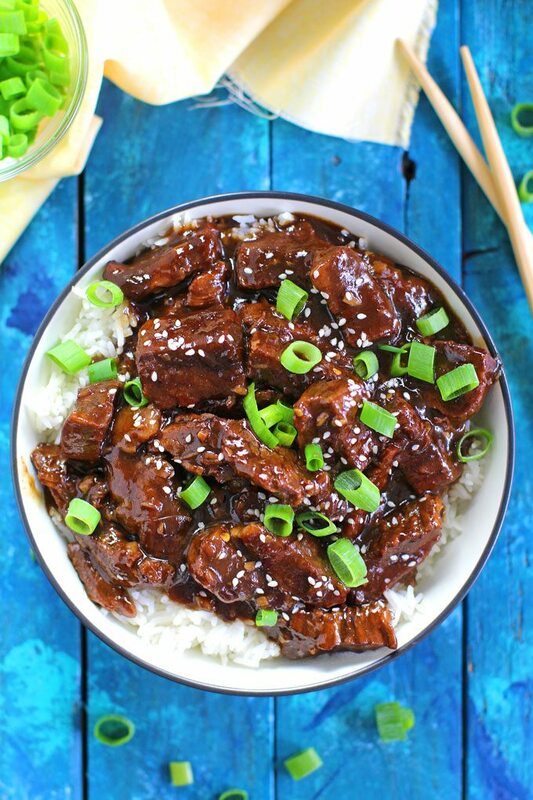 Instant Pot Mongolian Beef tastes even better than the one you would order at an Asian restaurant. This is our favorite Asian meal to make at home over and over again. 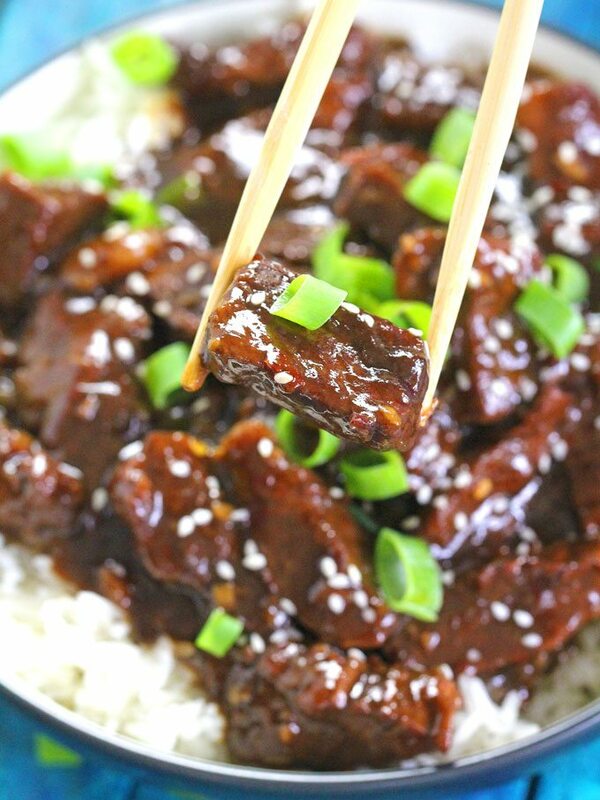 If you are addicted to Chinese takeout, I highly recommend trying this Instant Pot Mongolian Beef, as it will be done quicker than your local restaurant can deliver it. On top of that, you will be rewarded with delicious leftovers that you can enjoy the next day. Sweet and salty, balanced by lots of savory minced garlic and fresh ginger, this will become the favorite Asian dish to make at your home. Use quality meat. I always say this, but a good meat-centered meal starts with quality meat, preferably use organic beef for this meal. Also, the best cut of meat for Mongolian Beef is a flank steak. In addition, it is easier to cut it into thin strips. You can definitely cut the beef very thinly as it is served in restaurants. I personally prefer to cut it a little thicker, so don’t be afraid to experiment. 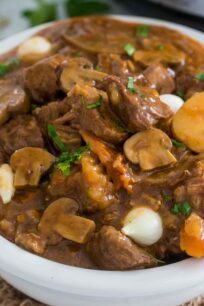 Traditionally, the beef in this recipe should be fried in lots of oil to make it very, very crispy, I decided to reduce the oil, sugar and all the frying in this recipe to make it healthier. 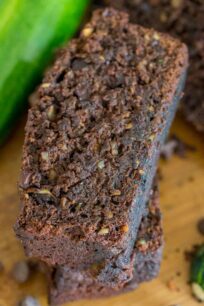 I used a LOT of garlic in this recipe, we love garlic in our family and I think it works really well with the sweet and salty flavors. Feel free to useless if you are not a huge garlic fan. Using fresh ginger and garlic will add amazing flavor and taste to the sauce. Only one pot to clean and that is the Instant Pot, so minimum dishes for you. 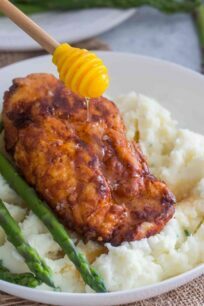 This dish can also be made in your Crock Pot or in the Instant Pot using the Slow Cooker function. Add browned beef to the Slow Cooker, add the mixtures except for the cornstarch slurry. Cover and cook on High for 3 hours or on Low for 6 hours. Make the cornstarch slurry, gently stir it in and cook on high for 20 more minutes. Serve and enjoy! Yes, chicken or pork is a great alternative for beef in many recipes including this one. The cooking time will also vary best on the cut that you choose. 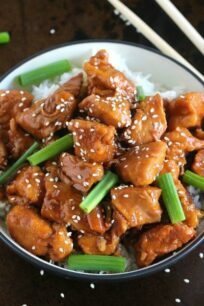 The chicken recipe can be found on Instant Pot Mongolian Chicken. A Natural Pressure Release means that the pressure is released gradually. For a Natural Pressure Release, you click on Keep Warm, and wait 10 minutes, after which you open the valve and let any leftover pressure release. Another option is to Turn Off/Unplug the pressure cooker, wait 10 minutes and after that open the valve. A natural release is usually used when cooking soups, meat in a large amount of sauce, pasta or steel cut oats. This method prevents any foam from the dish to shoot out through the valve, which can happen during a Quick Pressure Release. 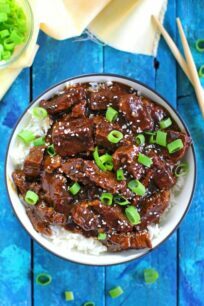 Instant Pot Mongolian Beef is a very easy and delicious meal you can make in just under 30 minutes. Add the oil to the hot Instant Pot, once the oil is hot, add the beef and sauté for 2-3 minutes, stirring a few times. If needed brown the beef in batches, you don't want to add to much as it will start releasing juice and it won't brown well. Note: You can also skip browning the beef and just add it to the pot! If bits of beef stuck to the pot, add 1/2 cup water and deglaze the pot. Using a wooden spoon scrape the bottom of the pot. You can discard that liquid if wanted. Add the rest of the ingredients to the pot: minced garlic, minced ginger, lite soy sauce, brown sugar, water, rice wine and red pepper flakes. You can add less sugar, based on your taste and preference. Make the cornstarch slurry, in a small bowl mix cornstarch with water until fully combined. With the Instant Pot on the Sauté function, add the slurry to the pot, stir to combine and cook for 2-3 minutes on Sauté, stirring occasionally, until the sauce thickens. 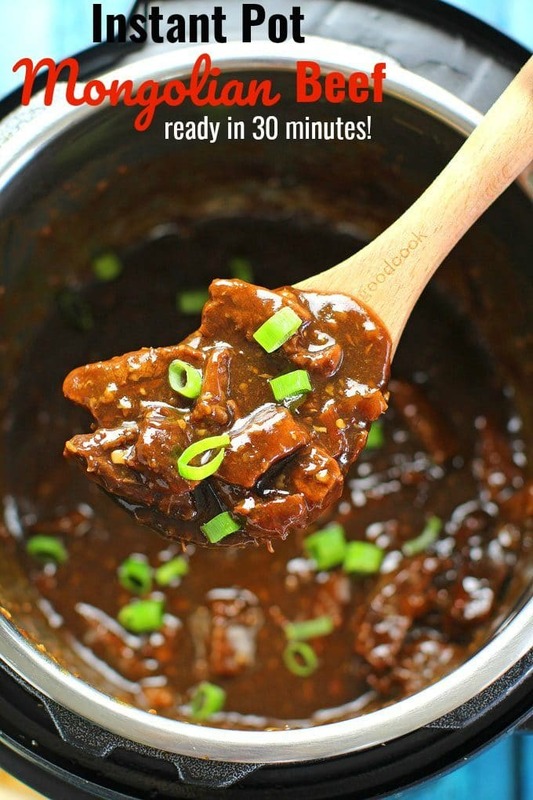 Turn off the Instant Pot and let the Mongolian Beef sit for 8-10 minutes before serving, in this time the sauce will settle and thicken more. This looks delicious. Is there a way to lower back the sodium content. It’s beyond to much. Hi, all the sodium comes from the light soy sauce, try using less soy sauce, use 1/2 cup, but also not that it will be sweeter if you use less soy sauce, so you may want to reduce the sugar too. My hubby would loooove this! Gotta try it! Why have I not tried this in my instant pot yet?! It looks so good! I clearly need to get my hands on an Instant Pot because this? Well, we need this in our lives this summer. Can’t wait to try this one! I love that you gave so many tips on how to I can customize the dish ! This recipe may be the push I needed to go get myself an Instant Pot. Looks incredible! That beef. That sauce. That color! I have to make this ASAP!! I’m always looking for new Instant Pot ideas! Bookmarking this to try soon! 30-minute meals are the best! This looks wonderfully flavorful. Such a quick and easy meal! I totally have to try this soon! Looks so tender and perfect! did it. loved it. added broccoli! So happy 🙂 thank you Melanie for letting me know!! Yum! I don’t have fresh ginger though. Is powdered okay? How much? Thanks!! powder is ok, use 1-2 teaspoons, depends how much you like the flavor. Thanks so much for this easy, delicious recipe. I had steak that was tough, so I used it in this recipe, and it was tender even with the short cooking time. I did reduce the red pepper flakes to a half teaspoon, and it was still plenty of spicy kick for us. I think this will be a regular, as we all enjoyed it. *20* cloves of garlic? That’s quite a bit. Is that a typo? Its not 🙂 its very garlicky 🙂 you can use less if you want! Hi, just wondering if I could do this without an instant pot or pressure cooker? Would it need to go in the oven for a long time instead? 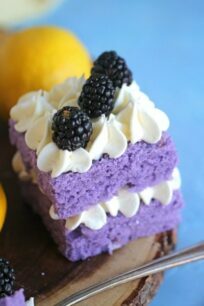 It looks so tasty I really want to try it!! Can you just use regular all-purpose soy sauce or will that change the flavor? It may be too salty, as the recipe is asking for a lot of soy sauce. Hi Janelle, the recipe asks for 1 cup of water and 1/2 cup of soy sauce, that is enough. Glad that you liked it Joan! Whenever I sauté with cornstarch, it always sticks and makes a mess. I ended up washing the pot after browning the meat and then put everything back in. It worked fine, but wondered if I did something wrong. The recipe is fabulous btw. No leftovers!!! Another option is to deglaze the pot with a little water. Glad that you liked the recipe, my family loves it too! When I sautéd the beef-starch it stuck to the bottom as well. I tried using a bit of water to deglaze but it didn’t do much to unstick the bottom. I was sure I would have to soak the pot. When it was done, the bottom was clean. Surprised me. Hi Kim! I hope you love it, let me know if you have any questions! It came out delish indeed. I changed some of the sugar only because I am a diabetic, and with other sugar substitutes it was awesome. I will use a leaner meat the next time. thanks again. Which sugar substitute did you use? How much is considered 1 serving? Superb, I tried and made it, was really delicious, thanks for this! Can this recipe be doubled? We have a quart instant pot. I was looking for ways to cook flank steak in my new Instant Pot. This was delicious, and I’m not a big Mongolian Beef fan, but my son loves it. I used sherry and rice vinegar to mix with cornstarch when thickening at the end, because his favorite Cooking Light recipe uses it. 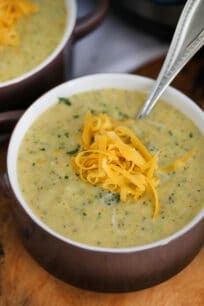 This recipe was SOOO much better than the original Cooking Light version, and in the Instant Pot!! I had a big bag of broccoli on hand, so I steamed it on the side and added at the end (which I was informed makes it not Mongolian Beef, but whatever, it was delicious.) I used three pounds of flank steak and doubled the sauce, which worked great. I also didn’t know about the pre-heating on Saute and getting the HOT indicator. Good to know. This was delicious!! Thanks for the recipe! This was my second recipe to make in my Instant Pot and it was Out Of This World GREAT!!! My Mom and Dad were over for dinner that night and they still talk about it! I tried this last night. It is amazing! The only change I made was adding a tablespoon of seasame oil to the sauce. Also adding fresh spicy peppers, which I put in everything. The sauce is a good mix of sweet, salty, spicy, and savory from the meat. Also very easy to make and clean up. Yum! Happy that you loved it! Do you think I can substitute pork shoulder for the beef? Thank you! Yes, cut it into cubes for this recipe. Can this recipe be doubled in a 6 qt instant pot? My 8 qt hasn’t arrived yet. Thanks! I just wanted to let you know that I made this for dinner and it was a huge hit! My husband said it was as good or better than what we get at our local restaurant. Thanks for the great recipe! I will definitely be making it again! Help! I made this and follows the instructions carefully-my sauce was super saucy and never thickened like I see in pictures. Flavor was great and we loved it, but the meat wasn’t crispy even though I did sauté it, and the sauce wasn’t caramelized at all. What did I do wrong? To get the meat to brown well, when you add it to the hot pan, don’t move it for 2-3 minutes so it gets a nice sear, after that stir, and again let it cook. If you start stirring too soon, the meat starts releasing water and it just cooks into its own sauce instead of browning. On the sauce issue, are you sure you used enough cornstarch? Also, maybe your beef released too much liquid from the start, since you mentioned that it didn’t brown well. I have made this a couple times for my family and guests. Comes out fantastic! I use London broil cuts of beef. Lots of fresh garlic and ginger make this recipe a hit. Served with rice, broccoli, and some fresh fruit. Yum, yum, yum! I too was going to use London broil. Should I cube the meat or still try to thinly slice it? This recipe gets thumbs up all round at my place here in Ulaanbaatar, Mongolia. I served it for the clan ranging from granny who is nudging eighty, to our daughter who is seven. The whole family loved the meal, and there were no left overs. There is only one recipe in Mongolia: kill animal, boil, eat. So, while not being authentic Mongolian, it is among the best received meal I have cooked here. It will be on the dinner table again soon! Thanks for the feedback and I am happy that you liked the recipe. Great recipe. Too bad Canadians are excluded from your contest though. Very good recipe – I made it, adding celery, peppers, carrots and sugar snap peas at the end. I also made rice at the same time – yum! I did find it a bit sweet – even though I cut wayyyy back on the sugar. We made this and the flavor was amazing. The leftovers aren’t even all gone yet and I’m looking forward to making it again. I made this tonight! It was wonderful! If I double the recipe….sauce and meat do I need to adjust the cooking time? no, not really, maybe by a minute, it will just take longer to come to pressure. So Good! I substituted coconut aminos for the lite soy sauce and it came out so good. I also chopped up green onions in large 2 inch chunks and cooked it with the mixture while pressure cooking. This will be a regular! I made this last night, it was wonderful ! Thank you for the recipe. I’ve made this 3 times in the last month. A new favorite! This time my butcher didn’t have any flank so I got flat iron. Oh. My. Goodness. Like butta! It was so tender. Hi Christine, I am so happy that you like this recipe 🙂 its always a hit with my family too! I just made this for the second time. First time I felt it was too sweet, but cutting down the sugar didn’t seem the answer to me…. this time I doubled the meat, upped cook time 2 minutes, and added 1 sliced Vidalia onion and some shredded carrots. This seemed to do the trick for us. My kids absolutely loved this dinner and requested to have it again for Christmas and their birthdays, haha! It makes a LOT of sauce though…I added a bag of steamed broccoli and could probably double the meat and still have enough sauce to go around. Very good flavor. Thanks! Hi there! I would love to try this out in the slow cooker, but I’m not sure how to translate it over. Would I need to saute the beef beforehand? And how would I add the cornstarch slurry at the end? Thank you, this looks delicious. Either way, I am excited to try! This was the first meat recipe that we have made in our Instant Pot and it was beyond delicious! I used round steak that was on sale and cut it as you would flank steak (against the grain). My 10yr old son, who is not a meat fan at all, loved it as well. This recipe is now going into rotation. So happy I found your site and looking forward to trying more of your recipes. Can this dish be made in a Crock Pot? Am not familiar with an instant pot. Sounds so good and looking forward to making it. Can I substitute 1 tbsp of Sirachi for the red pepper flakes? This looks delicious! I’m wondering how to convert this recipe to slow cooker or stove top, as I don’t have an Instant Pot. Thanks for all your wonderful recipes and mouth-watering photos! Easy to make and super dish! Delicious. Can I double this recipe safely? This recipe is definitely a keeper!! I made it in my Instant Pot and it was so easy and delicious! I didn’t have any rice wine so I just used dry white wine instead and it worked just fine. The only thing thing I would change next time would be to cut down on the red pepper flakes to a 1/2 tsp because my kids found it a little spicy. This was SOOO good! Loved the garlic and ginger flavor. I didn’t have the rice wine but look forward to making it again when I have that on hand. Served it with brown rice and sauteed brown rice and it was a perfect meal. Thanks for sharing a great recipe! I am super happy that you enjoyed it!! If I double the recipe, do I double all ingredients?? Hi! I made this dish and my DH raved about it! BUT …there are some changes I would make for next time! I found that there was a lot of liquid left over and it didn’t thicken up like in your photo! So next time, I would use 1/2 cup soy sauce, 1/4 cup water. After the cooking time is finished, I would assess the amount of liquid left over before I added another 1/2 cup water. I used just over 1 lb meat and that was sufficient for 3 people …iIf I was serving 4 people I would increase the amount of beef! I added 12 cloves garlic and a tad more fresh ginger …that is a must! The red pepper flakes was a perfect amount of heat. I forgot the green onions …opps! I had a cold, so my head wasn’t in the right place! This was the perfect meal …I was able to do my dishes in between, so the last minute clean up was a breeze! Kudos on a great find and thanks for sharing!!! Dumb question. On the sauté part at the beginning do you keep the lid on? I’m thinking so but I admit it – I’m an instant pot virgin! ? Nope, don’t cover unless it says that you should 🙂 and there are no dumb questions. I’ve made this several times now and it always comes out perfect. Thank you! Is this recipe for a 6qt. Instant pot? This recipe turned out FANATASTIC! I couldn’t find rice wine so I subbed sherry.inised a little extra oil to brown the meat. Took the meat out and the 1/2cup of water and wood spoon works GREATfor deglazing any steak bits. This also prevented that burn sensor coming on.my sauce took about 15 mins to thicken and then I left it for 10 with the instApot off.great recipe!! Oh my word!!! This was absolutely yummy and so easy!!! I used the 2/3 brown sugar and a bit more soy sauce instead of water. The whole family devoured it!! My first Instant Pot recipe and it did not disappoint. So yummy and easy. I used cayenne instead of red pepper flakes and it was a spicy. I’ll make sure to get red pepper flakes next time! Going to make this today – looks amazing. Just one thing; considering the HUGE plastic waste problem we have, damaging our earth and wildlife, how ’bout suggesting that you coat with flour (I’ll use arrowroot to keep it Paleo, as well as honey / coconut aminos) the old fashioned way – in a bowl? Sure, you’d likely have to use a bit more, but it’s a small cost to pay for helping the planet and it’s other inhabitants. Our reliance on plastic is killing our wildlife. hello! this looks great – going to make it tomorrow! could I do the rice at the same time using my trivet and an IP safe bowl? I’ve done this before for other recipes but not sure about the cook time being right for rice in this case. thanks for your help! No, not for this recipe. But check my Mongolian Chicken, that one you can cook the rice at the same time. I don’t have rice wine. What can I use to substitute? I have rice vinegar and red wine vinegar. Will any of these work? rice wine vinegar will work fine. How thick do I slice the flank steak? My husband made your Mongolian Beef last night. All I can say – Amazing!!!! That is all he talked all night….how perfect the sauce, seasoning etc was. We just got our instant pot and this dish changed my whole view. No need to order Chinese takeout anymore! Thank you!!! If I double the meat, do I double the liquid? Or is that too much? I like to double it, makes some delicious sauce. Made this last night and loved it. I accidently picked up a flat iron steak and was worried it might not turn out the same. It worked great and meat was so tender. I made sure I sliced the meat across the grain. Thanks for sharing. This was so amazing and tender! Family gobbled it up! This looks so good! I’m making my grocery list but I’m not sure if Rice Wine is the same as Rice Wine vinegar? Please help as I neeeed to make this tonite ? While both are made from rice, rice wine and rice vinegar are very different products and should not be used interchangeably. Pale dry sherry or dry white wine make good substitutes for rice wine, while apple cider vinegar makes a nice replacement for rice vinegar. Can I use filet Mignon for the meat? Hi Charlene, yes that should work just fine. Hope you enjoyed it as much as we! 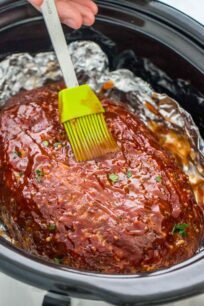 I wanna use a jarred PF Chang’s Korean BBQ sauce I have in my pantry, would that work and how much? Also, I want to add fresh green beans and some sliced mini peppers. When should I add those? You can add everything at the same time, as for the sauce about 2 cups I would say. Depends on how much beef and veggies you are using. Made it last night for my family of six. So yummy! My oldest loved it so much he wants to make it for his class on Tuesday! Only change: did not have rice wine, used rice wine vinegar. Yummy!! Just made this and it is absolutely delicious. I followed the recipe as written and could not be happier with the result. We loved this! It was recommended to us by our son, it’s delicious! Hi Denise, thank for your feedback. We are glad you have enjoyed it! This dish is also one of our favorites! Super easy and delish!! 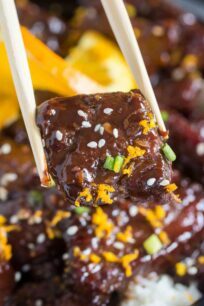 I have tried many Mongolian Beef Recipes and this is the best! Thank you! Happy that you loved it!